KAMPALA, Feb. 14 (Xinhua) -- As lovers across the world celebrate Valentine's Day on Thursday, for the Nzojiyobiris, it is another year of bliss. For theirs is special, bringing Africa and China together through marriage. 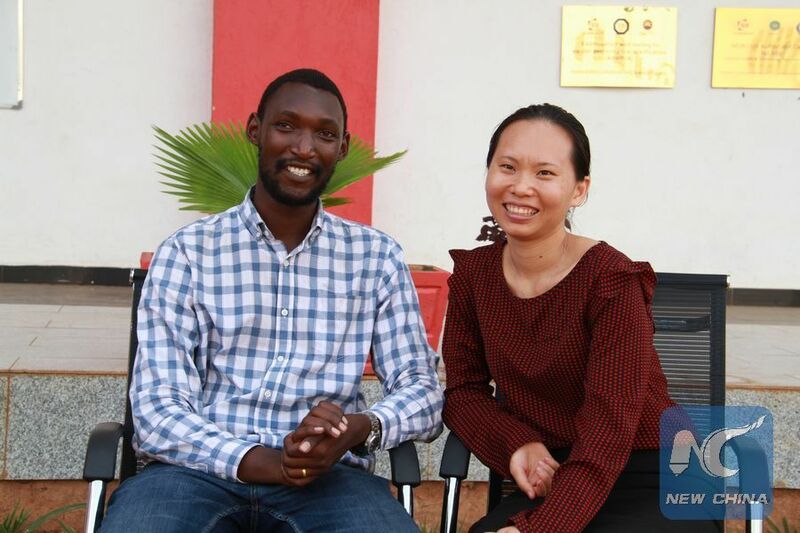 It all started when Cathy Gong was a junior student at Xiamen University of Technology and Blaise Armand Nzojiyobiri was a junior student at Xiamen University in China back in 2013. At one of the many parties, Nzojiyobiri met Gong and this is where it all started. At this party, Nzojiyobiri was with a Japanese girl, who was just a friend but this caused Gong to question. "That was the first time we met. There was a Japanese girl he was with and I thought she was his girlfriend. I thought they were a couple. I thought he was not the kind of guy I wanted," Gong told Xinhua in a recent interview as she held her husband's hand. Through WeChat, Gong actually discovered that Nzojiyobiri, was single and an interesting guy. "I found out he is incredibly sweet so I decided to date him and he went out with me, that is what happened," Gong said. For Nzojiyobiri, he said it was more of a natural flow of events. He said their love grew from friendship to an advanced level relationship. Gong was a village girl who was sent by her parents to the city to study. When she came back to her parents, she told them she has got a husband, more so from Africa. This was a shocker to Gong's parents because in rural China, parents are not used to their children marrying foreigners, more so from Africa, a place that is considered to be remote. Gong's mother was not comfortable with the decision her daughter had taken. She was not sure of where her daughter was going. "It was the first time they ever met a black person and this person spending life with their daughter, it was a difficult moment," Nzojiyobiri said. But luck was on Nzojiyobiri's side because he had mastered the Chinese language. He spoke to Gong's parents in Chinese all the time. This softened Gong's mother's heart. "My mother was now always on his side. They approved of our love and everything we do together and they have been very supportive after," Gong said. "Now they are trying to teach me, you need to be a good wife to your husband, do this or that for him," Gong said. For Nzojiyobiri, it was a bed of roses. His Burundian parents did not have any reservations for this love. Nzojiyobiri's father and mother studied in China and they understood who Chinese people are and their cultures. They have lived with Chinese for over 20 years. So when their son told them he had found love in China, they gave him a green light. "The first and unique answer was: As long as you love each other and good to each other," Nzojiyobiri said. The Nzojiyobiris have now been together for more than six years. Early this year, they legalized their marriage, first with a ceremony in China in August last and then a Church wedding in January. Cross cultural marriages come with all their challenges but for the Nzojiyobiris, they decided to focus on love. Socializing with other people who are into cross cultural marriages has also helped them a lot. "We have adapted to each other naturally so I don't think there are any challenges," said Nzojiyobiri. One thing that Gong does not approve of, is polygamy. "I don't approve of the men who can have many wives. But it is traditional so I don't have any problem with it although I don't approve of it," she said. Valentine's Day is around the corner and Gong says she has not got any ideas yet but hopes that may be she would get flowers. "But these days we are very busy," Gong said. Gong is the Chief Executive Officer of Sunshine Education and Technology Ltd, affiliated to Sunmaker Energy Uganda Limited, a Chinese owned oil institute in Uganda. Nzojiyobiri is a businessman. Nzojiyobiri said his plan for Valentine's Day remains a top secret. He plans to surprise his wife. House chores in Africa is mainly exclusive for women because most of the times they stay home as their husbands go out to work. For the Nzojiyobiris, they came up with a formula that whoever comes home first does the chores. Some times Nzojiyobiri would do the chores when his wife is having a rest. About having children, Gong is focused on having two children. However it is a touchy subject as Nzojiyobiri's relatives say Gong can have as many children. Nzojiyobiri said their focus as a couple is having two children but the number could go up if they change their mind.